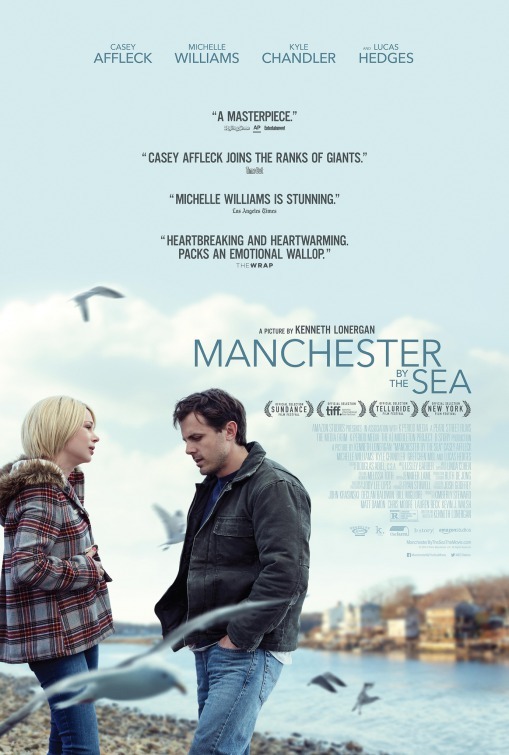 A wonderfully acted emotionally packed drama. An uncle (Casey Affleck) is asked to take care of his teenage nephew (Lucas Hedges) after the boy’s father (Kyle Chandler) dies. It’s always a pleasure when a film can surpass your expectations and reward you with something so much more. It was funny that I was complaining about the La La Land hype with this entry coming in a swift second on the overbearing hype train. BUT I have to say, this was brilliant. Casey Affleck has always played strange roles from introverted wackos to isolated loners. This role was perfect for him. He made the socially awkward Lee work a treat. The slow burning style allowed the drama to unfold perfectly. We followed Lee as he trundled along his humdrum lifestyle of a janitor at an apartment building. The mundane tasks, the strange tenants, the complaining and weird requests. A ticking time bomb waiting to explode. The news of his brother’s passing triggering flashbacks. Flicking back and forth between the past and present as we got a better understanding of Lee and the reasons behind his fractious relationship with his nephew. Baffled to be awarded guardianship after all that had happened. I hadn’t read anything about this film and the revelations with Lee’s past completely surprised me. Don’t worry, no spoilers here. Lonergan has written a heartfelt story that dealt with grief on such levels. It was almost real. The awkward exchanges as Lee had to deal with depressing funeral arrangements, idle chit chat and various reactions from people as they learnt of his brother’s passing. It couldn’t be more in tune. It is a huge gamble to make a 2 and a half hour movie that relies solely on two leads. BUT I don’t think it would worked without Hedges and Affleck. They were brilliant. The power of a performance that can deliver such emotion that you get caught up in it. There were several scenes that actually got to me. I felt for all of them. Affleck deserved that BAFTA. It was surprisingly funny, upsetting and dark. I went through a rollercoaster of emotions as did our protagonist. Struggling to communicate with an awkward teenager who was more concerned about his social lifestyle than his father’s death. The tension bubbling away as Lee, a creature of comforts, seemed desperate to get back to his quiet life. Of course, he had his reasons. A scene involving frozen meat triggered an unexpected breakdown out of the blue with the pair finally coming to terms with their feelings. I laughed, I cried. Superb. I remembered Lonergan’s last effort Margaret being one for a testing pace and I know a lot of people grumbled about the pace of this one. BUT I can’t even say this dragged. I was completely engrossed with the characters and the drama. I wanted more. The supporting cast played their parts perfectly. Michelle Williams wasn’t in this enough. From all the hype, I expected her to be in this for a good portion of the film. Her screen time probably only accumulated to 15/20 minutes? BUT she was excellent as Lee’s ex-wife. Their reunion was heartbreaking as we realised that Lee was a man tormented by his own demons long before the news of his estranged brother’s death. Always happy to see Mr Friday Night Lights Kyle Chandler get more screen time as Lee’s brother. Gretchen Mol (Boardwalk Empire) delivered as his volatile widow and I didn’t expect to see Matthew Broderick pop up in this? Despite my praise, I still had my grumbles. I’m not sure whether it was the cinema surround sound BUT I found Lesley Barber’s music score overbearing. It didn’t take away the emotional impact of the scene BUT I found myself getting increasingly irritated. It felt like someone was playing with the volume (Maybe they were. I did watch it in forum). It was only the final act that disappointed me. And that was because it didn’t go in the direction I wanted. Forever a cynical optimist (Yeah, work that one out). Hoping for a happily ever after for the troubled pair. BUT as the credits rolled (and a little more discussion after), I couldn’t see any other way that the story could end. It worked. I went expecting in nothing and came out rewarded with a brilliantly acted and well written drama that dealt with grief on many levels. It is a little gloomy BUT if you’re in the mood for a drama that delivers on the feels, look no further. A massive mistake for Depp? Another black mark to put against his flailing filmography? There’s only one way to find out. The true story of Whitey Bulger (Johnny Depp), the brother of a state senator (Benedict Cumberbatch) and the most infamous violent criminal in the history of South Boston, who became an FBI informant to take down a Mafia family invading his turf. A mixed bag, to say the least. A stellar cast do their best to reprieve a meandering mob flick. Johnny Depp was superb. It’s okay looking the part. BUT you need to bring a performance to back it. One that he brings by the bucket load. As soon as he made his introduction with those icy cold blue eyes, I was sold. BUT for all the promise, I expected so much more. For those who are familiar with Whitey’s story, you may find that this latest re-telling brings nothing new to the mix. The opening really didn’t things going as we were introduced to all of Whitey’s highly unmemorable henchmen as they provided testimony against one of the FBI’s Ten Most Wanted Fugitives. Other than wearing a really bad wig, I questioned the relevance of Jesse Plemons (Friday Night Lights). I had to laugh at the fact his testimony, in terms of narration, detailed events where his character was never present. Depp certainly carried the piece. BUT considering he was supposed to be the main character, he wasn’t in it as much as you think. I have to say that Black Mass was a very patchy affair. We had a slow but interesting build up as we watched the small time crook expand in his neighbourhood. BUT after a dull and chunky bit of exposition with the FBI, the film suddenly flash forward. Skimming over crucial moments of Whitey’s ever-growing empire. I was disappointed that we didn’t even get to see the low level gangster make that transition. He was a small blip on the FBI’s radar in one frame than a massive target in the next one. The passing comments from the FBI agents about his drug business and confrontations with the Mafia sounded great. BUT why couldn’t we see that? 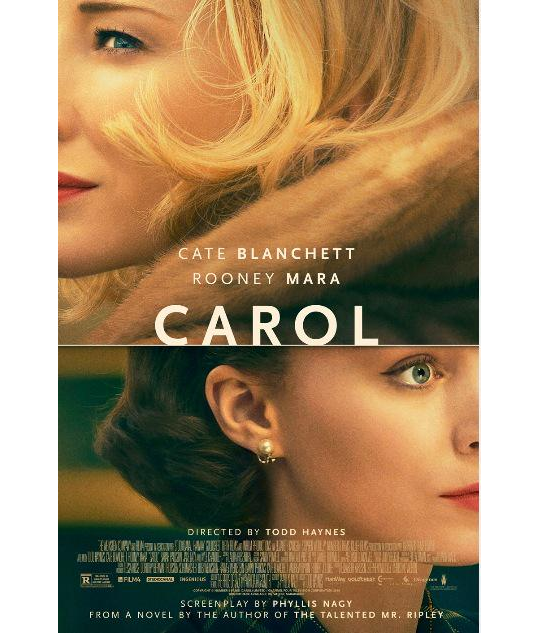 Juxtaposing sinister shots of Depp with pictures of bodies wasn’t enough. I wasn’t completely bored. He bumped off a few people here. Delivered a creepy speech there. There was one brilliant scene in which Whitey educated his fellow handlers on the value of keeping secrets. Spine tingling. BUT where was that tension throughout the rest of the film? I didn’t mind that they tried to bring a little humanity to Whitey’s character. His care for family and respect among the community may have been intense (A little bonkers, even) BUT you could almost feel a little empathy for the nutcase. BUT what infuriated me was how this huge ensemble wasn’t used to their full potential. Adam Scott (Krampus) might as well have been an uncredited extra. Kevin Bacon’s character only really got going in the closing minutes. Peter Sarsgaard didn’t do a bad job as the volatile Brian Halloran BUT was shipped out too quickly. Joel Edgerton (The Gift) was brilliant as FBI agent (and neighbourhood chum) John Connolly. It was interesting to see his transformation from a timid pencil pusher to a cocksure untouchable with shades and swagger in tow. His ruthless egotism was something else. The lovely (if slightly stick thin) Dakota Johnson (50 Shades of Grey) was wasted in her role as Whitey’s wife. Anyone could have played her. She only really delivered in one scene (The one she featured in). Julianne Nicholson (August: Osage County) managed to make a slightly more memorable turn BUT was still underused as Connolly’s spouse. 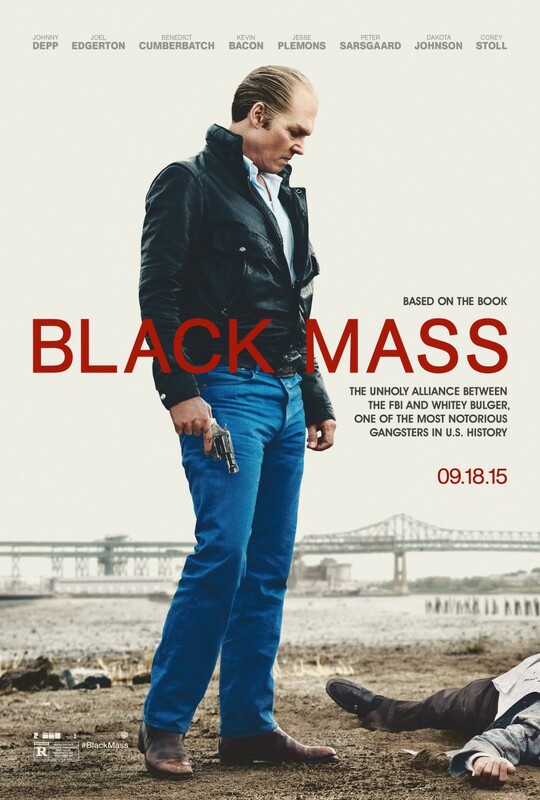 I couldn’t compare Black Mass to any of the other gangster flicks because it tragically fell short of them. I really wanted to like this. There were some crazy statistics and moments that did surprise me about the gangster. The deals with the FBI were outrageous. BUT that was it. A movie of moments. A great cast do their best BUT the wafer thin story was something I expected to see in a True Crime biopic NOT a theatrical release. Into the Bore-m for me. I knew I was heading into something stupid but this is just ridiculous and not even the good kind. 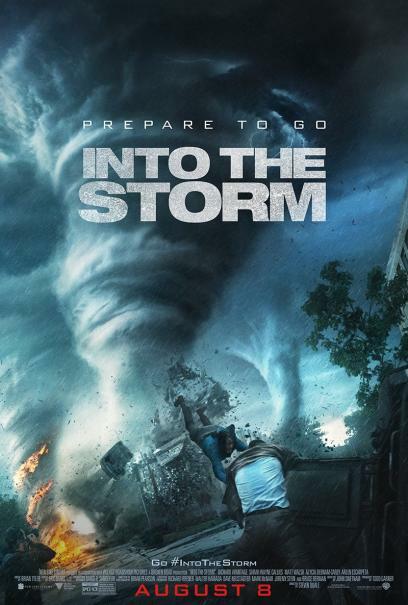 A concept that was promoted as Twister meets The Day After Tomorrow and yet this turgid drip of an affair managed to make them look like epics by comparison. Oh my goodness. The special effects are brilliant. That is when the shaky camera work focuses enough to actually see what’s going on or when it decides not to suddenly stop recording (The budget must have ran out). You know you’re in trouble when the highlight of the film is two dumb red necks with a Go Pro camera trying to get a million views on YouTube. Look, I know that these films are supposed to be big and dumb. The sort of films you switch off and bask in the action and visual imagery. But for the opening 30 minutes of an 84 minute film, I was force fed corny, clichéd characters that grate on you with predictable and trashy hokum in a lazy attempt to feel some emotion. All the generic stereotypes are there. Geeky video club student with daddy issues. Hasn’t spoken to crush. Chooses the last day of graduation to try one last gesture to show affections. That and restricted video footage of little freak weather occurrences in the form of heavy rain and screaming high school students. Eurgh. Now I accepted all the ridiculous scientific mumbo jumbo explaining why there are four tornadoes hitting one spot and when we finally get to see the storm hit full force; it’s watchable and suspenseful enough. It’s just a shame I couldn’t give a stuff about any of the characters. I was praying that a stray cow may take a couple of them out for me (Yep, there were cows flying around. Lazy) Nathan Kress (you may remember him from iCarly) was one of the more memorable characters with his witty banter and comedy commentary. Any other movie, it wouldn’t have worked. This reeked of a straight to DVD B-Movie with TV actors chucked in. The main actor that I was surprised was actually dragged into this was Richard Armitage. Must have wanted to top up his bank balance in between Hobbit movies. His accent is impeccable but he plays it straight faced which makes him incredibly bland and comes off more comical than it should. 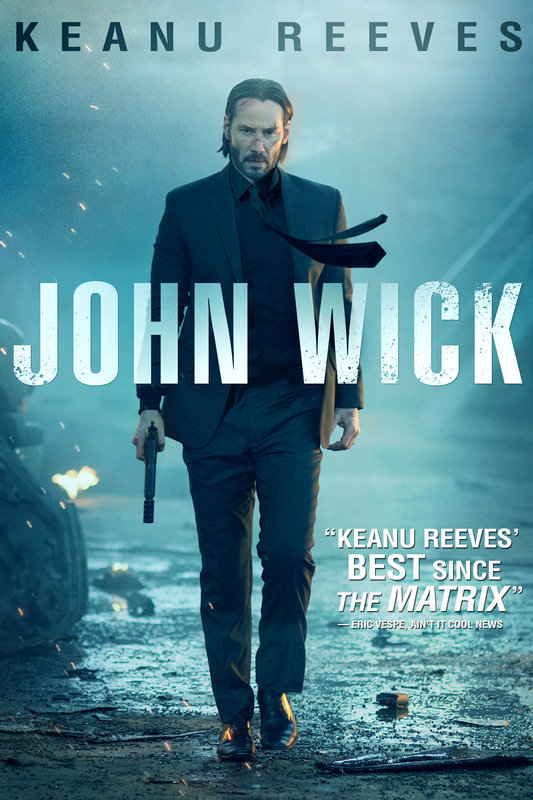 A stain on his other wise reputable movie career. Sarah Wayne Callies (The Walking Dead/Prison Break) plays the attractive meteorologist that no one listens to. She spouts her clichéd background and random weather terminology with as much gusto as she can but let’s face it, who cares? The lines are bland and flat. The characters are stupid and irritating. It’s so stupid that the situations that the characters find themselves in are so unrealistic. I mean for an example, the crew have a tank called The Titus (the all singing, all dancing advancement in weather combat blah blah blah). A tree lands on it. The doors are still accessible. In all fairness, the Titus is a cheap knock off of the Bat Mobile from the Nolan universe. So instead of running round and getting into the still accessible Bat Mobile, I mean, Titus. What do our crew do? They run 300 yards in the opposite direction to a tatty old church where the impending fire tornado is spitting cars like rain (A cool little scene of special effects). I think I’m going to purge myself from seeing any more of these films for the foreseeable future. It’s not bad enough that the first one wasn’t that great. To hear there was a sequel, I was baffled. However, that ultra cool trailer worked its magic and had me intrigued. The promise of an anarchic Escape from New York meets Marathon Man mesh up had me ticking all the boxes. Alas, this time around it’s another misfire. A great concept that fails to reach it’s true horrific or satirical potential. The opening 30 minutes was slow burning but actually quite watchable. 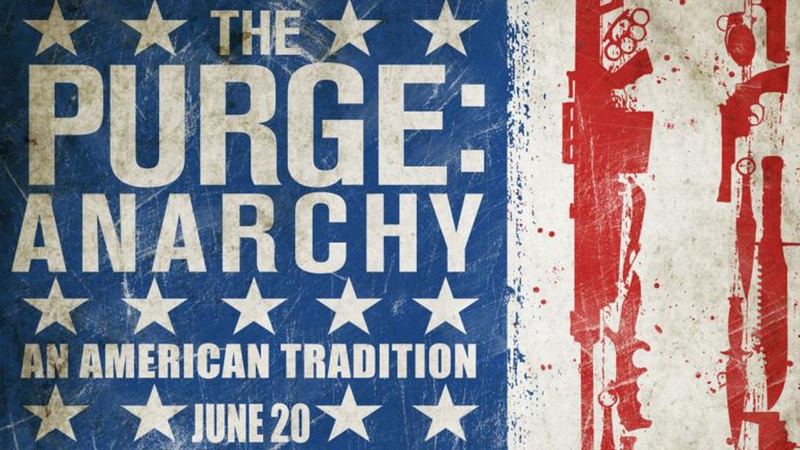 The fact that this time around we are seeing The Purge on the streets not just in a rich suburban household made it that much more interesting and the introduction of multiple characters helped keep the pace going and freshened it up. However, once we get past the introduction of the newbies, you can’t help but pick at their flat one dimensional clichéd templates. Now I know these films are not going to deal with the human condition and aspires to be nothing more than an futuristic urban thriller with the inevitable picking off of each member but still . . . could it at least try and be less predictable? I cannot call this a horror, as such. The concept is horrific in itself but a few moments of blood and gore and a couple of jumpy moments does not a scary movie make. Although unfortunately with horror films of late, that does seem to be the case. How the characters unite in their struggle to survive is well done and pacey. However, with all typical “horror movies”, the inevitable squabbling and issues before the Purge pop their ugly heads and it soon becomes very soap opera-ish and very dull. It would help if they had a character that you actually cared about . . . and for a moment we do. Welcome Frank Grillo (Captain America: Winter Soldier) as the mysterious Sergeant. His Death Race armour cladded vehicle. Suited and booted and scouting like the streets like the Punisher. A predator hunting for his prey. However, this protagonist has a particular, if predictable, kill in mind. Grillo has always been an underrated actor and this performance shows the charisma that he carries. His moody mystery man helped lift a film that seemed to be losing more and more of its momentum as the running time dragged along. To be honest, the most memorable characters (minus Grillo) are the captors with their creepy masks. Oh yes, the creepy masks are back. However, after a while, you realise they are just riding around on bikes screaming. Jack Conley (LA Confidential) certainly made a mark and will no doubt become a cult character as Big Daddy. Hunting around in a black delivery man with . . . oh yeah, a chain gun in the back. There are moments of action that cure the blood lust but it’s all pretty tame. There were a few twists to be had on their way. The idea of the rich using the Purge as their own little play day was a nice bit of satire. There were some moments that were a little creepy. The fact we follow a man carrying a case of beer and setting up a sniper rifle as if he’s going fishing was demented but brilliant. However, it’s all moments. After a while, you realise that’s it. The cast squabble. Zach Gilford (Friday Night Lights) seems to be playing the same role over and over. His bashful, anxious boyfriend character is getting really old. The whole “This is wrong. Killing is bad” is pointless in a film like this . . . especially when being pursued by bloodthirsty nutters. It seems to get caught up in its own ridiculousness and ends up becoming a parody of itself. A clever and highly hilarious scene in which the rich are bidding to kill a group of people was unexpected. But the Marathon Man-esque garden party purge sequence that followed was overkill. It certainly injected some much needed tension and suspense as Grillo is trying to save the gang against suited and booted millionaires with night vision goggles. However, it all gets incredibly predictable, corny with a hokey ending that killed off any buzz that this film desperately tried to generate. Michael K. Williams (Omar from The Wire) as Carmelo. My word. Now that was horrific. His anti-Purge campaign videos were flat as hell as he spouted utter bilge and his appearance near the finale. Let’s just say he does his worst Samuel L Jackson impression. Awful. A shame for a really talented actor. You could tell the film had lost it by the fact a good portion of the audience were laughing. Kind of the reverse effect, wouldn’t you think? 2/5 for me. Currently ranks #180 out of 199!